Earlier this month, I had the pleasure of strolling through South Portland with author Polina Olsen. She pointed out the remaining landmarks from Portland’s once-upon-a-time immigrant neighborhood and shared some of the stories that she’s collected from residents. Thanks to her descriptions, I was able to imagine the kosher deli on the corner and the stable that once housed the junk peddlers horses. In short, her words brought the neighborhood’s past to life. In his recent review of Olsen’s book Stories from Jewish Portland, author and noted genealogist Bill Gladstone discusses Olsen’s contributions to documenting Jewish Portland’s vibrant history. 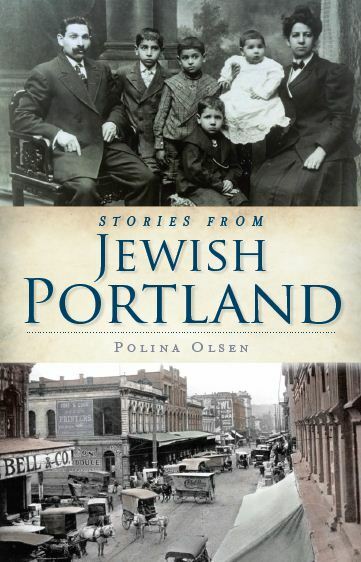 If you have roots in Jewish Portland, you may be interested in a recent book — Stories From Jewish Portland, by Polina Olsen (The History Press, Charleston, S.C., 2011). Olsen has collected many stories of the Jews of Portland. Their roots go back to the gold rush and their heart is the “old neighbourhood” of South Portland. The history dates back to the 1848 California gold rush, when Jewish merchants followed in the footsteps of the prospectors. Peddlers and would-be general store owners, they moved north as new deposits were found. Others arrived via the fabled Oregon Trail…. To read more of Gladstone’s review, please follow this link. To find out more about South Portland’s past, check back late this summer for Olsen’s forthcoming history of 1960s Portland. Stories from Jewish Portland by Polina Olsen is available at Powell’s, Annie Bloom’s, and other fine Portland book establishments.